First appearing in Histoire de Babar, Jean de Brunhoff's 1931 storybook classic based on a tale that his wife Cecile had invented for their children, Babar the Elephant has, for 80 years, captivated millions around the globe. The story of the little elephant who leaves the jungle, visits a big city and returns to bring the benefits of civilization to his fellow elephants has been captured in a multitude of best-selling books and several animated series. DISCOVER THE MAGICAL WORLD OF THE BELOVED ELEPHANT KING WITH THE ORIGINAL, ANIMATED SERIES ON DVD FOR THE FIRST TIME AS A COMPLETE SEASON! First appearing in Histoire de Babar, Jean de Brunhoff's 1931 storybook classic based on a tale that his wife Cecile had invented for their children, Babar the Elephant has, for 80 years, captivated millions around the globe. The story of the little elephant who leaves the jungle, visits a big city and returns to bring the benefits of civilization to his fellow elephants has been captured in a multitude of best-selling books (over 12 million sold worldwide, and more than 1000 titles in print) and several animated series, including "Classic Babar" which currently airs on NBC, Telemundo and Ion, as well as a new hit series, "Babar & the Adventures of Badou", which airs daily on Disney Junior. This June, Entertainment One invites families to discover the magical world of de Brunhoff's elephant king with the debut DVD release of Babar - The Classic Series Season One . 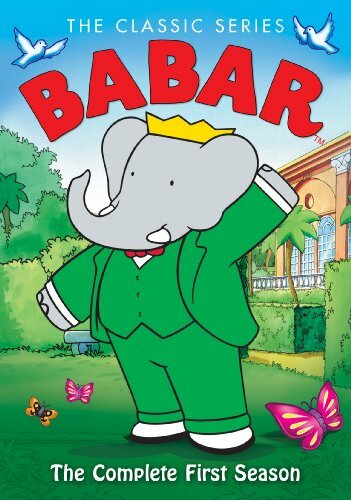 Hailing from the acclaimed, award-winning HBO Family series, these wonderfully animated stories - 13 episodes in all that are perfect for the whole family and never before available together as a complete season - follow Babar, his family and friends in Celesteville undertaking many challenges and adventures, all while teaching the most valuable lesson of all: despite life's challenges, great things are possible if one never gets discouraged. As Babar says, "Long live happiness!"